Speargun made of carbon fiber with monoblock body - muzzle. Extraordinary compination of power and maneuverability. • Body with special contoured shape for perfect movement in horizontal and vertical axis in compination with increased stiffness. • Trigger Mechanism Bleu tec Lycan (housing stainless steel 316 aisi, trigger & sear made of stainless steel 304 aisi). • Mechanical line release system with automatic retraction. • comfortable handle (for right and left hands). • The part of delivery is also the anatomically shaped handle attachment for right hand. • Supplied with 2 bands 16mm Black Power, shaft Bleu tec 6,5 mm Diamond (faceted cross-section) with 3 shark fins from heat treated steel. - 2 bands 17.5 mm Black Power, shaft Bleu tec 6,75 mm Diamond (faceted cross-section) with 3 shark fins from heat treated steel. - 2 bands 17,5 mm Black Power, shaft Bleu tec 7 mm Diamond (faceted cross-section) with 3 shark fins from heat treated steel. - 1 band 19 mm Black Power, Rod Bleu tec 6,5 mm Diamond (faceted cross-section) with 3 shark fins from heat treated steel. • The carbon fiber products of Blue tec manufactured to order. • The gun length refers to the distance between the trigger guard and the band's hole. 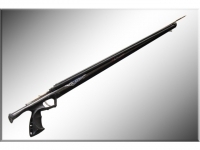 • The weapon is accompanied by a 5 year warranty on the body of the weapon and lifetime for the trigger mechanism. This Product was added to our catalogue on Monday, 09. September 2013.